Incredible Clients and We Work Around Your Schedule! Care To Stay Home will work with you around your scheduling needs. 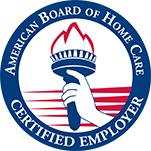 Care To Stay Home is a family owned business that has provided Home Care to families through-out Spokane for over 10 years! Our experienced and mature team respects our employees and works with you to accommodate your needs. We offer ongoing, stable schedules for our Home Care Aides to provide stability for you and your family. Currently, we have many openings (3-12 hours) available for IMMEDIATE placement! !